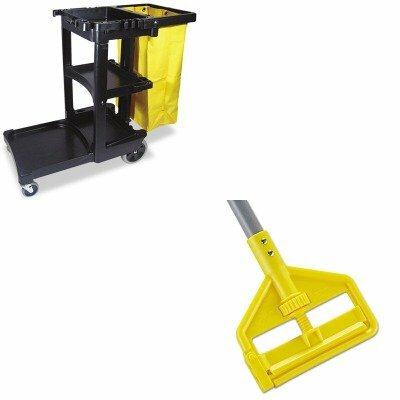 lt;stronggt;RCPH145lt;/stronggt;lt;BR/gt;Rubbermaid Invader Fiberglass Side-Gate Wet-Mop Handlelt;BR/gt;Easy-change, side-gate design allows you to quickly slide mop heads on or off. Adjustable thumb wheel enables stress-free, tight and secure clamp down. Solvent- and acid-resistant frame enables use with all commercial floor stripping agents. Handle Length: 54amp;quot; Handle Diameter: 1amp;quot; Handle Material: Fiberglass.lt;BR/gt;lt;BR/gt;lt;stronggt;RCP617388BKlt;/stronggt;lt;BR/gt;Rubbermaid Invader Fiberglass Side-Gate Wet-Mop Handlelt;BR/gt;25-gallon vinyl bag attaches to handle. Three shelves for supplies hooks for mops and brooms. Platform holds standard size bucket supplies not incl.. Color: Black Caster/Glide/Wheel: Four Casters.